For as long as marijuana has been around – which, let’s face it, has been a pretty long time – it has been used to relieve symptoms of pain. From chronic backache to headaches and migraines, it seems as though the cannabinoids found within cannabis have an abundance of uses. As cannabis has become more accepted across the U.S. and the rest of the world, we have seen an influx of new and innovative products, allowing for alternative ways to medicate with the plant. One such method is CBD creams, otherwise known as topicals, which can be applied directly to the “problem area” for fast-acting and direct pain relief. If you are one of the 350 million Americans suffering from Arthritis or one of the even higher numbers of those struggling with joint pain, stick around to find out our top five recommended CBD creams that will help relieve your symptoms with ease! Cannabidiol, more commonly known as CBD, is the non-psychoactive compound found within marijuana and is responsible for a host of the medicinal benefits that the plant has to offer. Similarly to THC, CBD binds to cannabinoid receptors located throughout the body to aid in the relief of a multitude of symptoms from anti-inflammatory properties to offering potent pain relief. There has been a multitude of studies which have revealed the true anti-inflammatory potential of CBD, which has led to topical products raising in popularity as a non-psychoactive way to treat muscle soreness, inflammation and arthritic pain fast. Applying CBD in topical form to problem areas can improve joint dexterity in athletes, offer post-workout pain relief and muscle relaxant, and can help ease pain and swelling in people living with arthritis. Pure Kana is one of our favorite CBD companies, currently supplying a host of CBD products to all 50 states of America. Today we are looking at their Topical CBD Ointment, which is new and improved and one of the best on the market. Pure Kana offer their CBD ointment in just one size at 3.4oz/600 mg CBD, which you can get your hands on for $80. This product is long-lasting, as a little goes a long way! As with all of their products, Pure Kana’s CBD ointment uses only the best produce sourced from Kentucky, infused with rich moisturizing cream for a luxury experience every time. The CBD in this ointment is combined with cooling, icy menthol for an extra feeling of relief, perfect for those with sports-related inflammation or arthritis. This smooth, thick ointment glides on with ease, has a pleasant menthol scent, and acts fast to reduce feelings of pain and stiffness. With less than 0.2% THC, this is a product ideal for all ages and can be applied to external pain-points for long-lasting relief. Green Roads are a well-established name in the CBD industry, being the leading manufacturer and distributor for over 5,000 retail stores! Green Roads are the go-to for high quality, CBD-rich products and their CBD pain creams are of no exception! First, let’s take a look at their CBD pain creams, which come in 150mg for $39.99 and 300mg for $69.99. Green Roads CBD pain cream offers a paraben-free formula designed to reduce symptoms of aches and pains while being super kind to the skin. This ethical company knows how to be kind to the skin, infusing their cream with menthol for the pain and lavender oil and chamomile extract for smooth and healthy skin. Green Roads use a tried and tested extraction method to produce this incredible cream via supercritical CO2 extraction, and the result is then winterized to remove all those unwanted and harmful substances, leaving behind only the best CBD. Green Roads also offer a CBD Skin Relief Cream costs $49.99, featuring innovative ingredients to provide an all-natural and super soothing cream. The CBD Skin Relief Cream uses pure hemp extract oil and a host of other beneficial ingredients such as Vitamin E, grape seed oil, and other essential oils for a truly luxurious experience. Los Angeles based company, Premium Jane offer a wealth of knowledge and industry expertise to bring high quality, super sourced CBD products to the market. Their CBD Topical Salve is a real one-of-a-kind product that had to make it into our top five today, with a real premium feel for an affordable price you’d be inclined to agree! Offering just one size of the CBD Topical Salve at 600mg for $80, Premium Jane are a cut above the rest for quality, making the high price mark worth the investment! Sourced from the same 100% organic USA-grown hemp as their other CBD products, this topical is something else. CBD infused with rich hand-selected moisturizing cream, this salve is more than just a CBD treatment, and more like a pamper routine! With no artificial colors, flavors or animal-derived ingredients, this is undoubtedly an ethical and kind to the skin option for those with a higher budget, and full third-party lab test results can vouch for its quality. Hempbombs are a huge American distributor offering all-things CBD, from edibles and oil to topicals and CBD for your pet! Hempbombs’ new CBD pain rub is specifically designed to target pain fast, with triple-medicating bio-coolant technology to provide fast acting effective relief to arthritic pain, back pain, joint pain, and sport-related pain. If you have been a long-term sufferer of pain, you will know how debilitating it can be, but Hempbombs have combined cold therapy with CBD to produce a perfect soothing solution. Available in 50mg and 200mg, these Aloe Vera-infused creams are the next best thing to a medicated ice-pack! With two products to look at from CBD essence today, let’s jump straight in shall we? 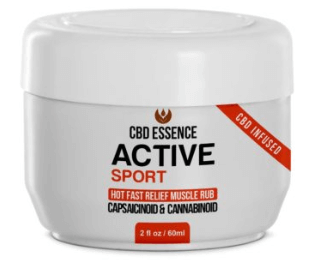 First up is the company’s CBD Active Sports Hot Muscle Rub, which comes in 2oz / 500mg for $41. This topical is targeted at those active in sports who may benefit from regular relief from muscle soreness. Using full-spectrum CBD oil and capsaicin, this combination makes for a hard-hitting treatment. If you’re a hard-core athlete, then you probably experience muscle pain that comes part and parcel with exercise. CBD Essence has made a remedy with this kind to skin lotion designed with sports therapy in mind. Second up is CBD Essence’s CBD Active Lifestyle All-Purpose Lotion, coming in 2 oz / 600mg for $41 and offering an all-round sports relief therapy designed for general aches and pains. For overall wear and tear, this is an ideal option which can last for a long time, as a little goes a long way! Every company we’ve featured today has high-end products driven towards the relief of muscle aches, joint pain and arthritic symptoms that can be debilitating for many. If you are looking for an alternative treatment to medication, CBD topicals are the non-psychoactive way of combating pain and stiffness with ease. Let us know in the comments your experience with CBD topicals! Can this be for me? I have no conditions but i have very bad knees and i am only 28 – do you think it will work without a diagnosis even??? I am a long distance runner, so for me the CBD Essence topical has been an absolute life saver!! I use it on my knees and lower back every day after a run, and it eases tension and strain along with pain in no time at all!